Step 1 – In the first part of the document the landlord or tenant, depending who is filling-it-in, will have to check the applicable box and then write the dates, along with the amount of time the other party will have as notice. Thirty (30) days is the minimum. 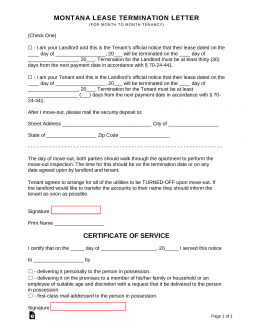 Step 2 – If the tenant is filling-in the form they should mark down the forwarding address to where the landlord may send their Security Deposit (if any) that was given in the beginning of the term. Step 3 – The Certificate of Service should be sent to the other party which is legal notice which may be needed at a later time if the other party claims to have never received the letter.